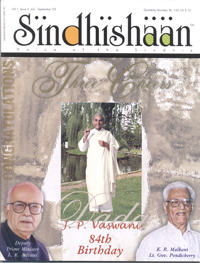 I just received the beautiful April issue of Sindhishaan. Prior to that also I had received one issue. Thanks. I congratulate you for taking out an English magazine for Sindhis, which has both quality and substance. I admired the covers, the art works which are aesthetic and are of good taste. This is really the need of the hour !